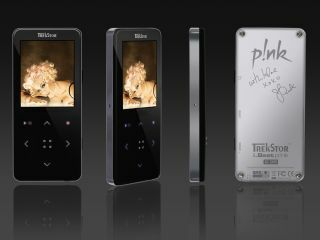 Rock star Pink has lent her name to a new MP3 player from Trekstor , part of the i.Beat range. The i.Beat p!nk player, unveiled at CES, is engraved with her signature. Available in a 2GB capacity, the player provides around 10 hours of listening on a single USB charge. It's available in black and, er, pink. The German firm also announced a new hard drive-based MP3 player in 8 and 12GB capacities. Called the Vibez, it features a 1.5-inch TFT screen, the player has a rubberised scroll wheel and 20 hour battery life. Video playback will be added the future, though an FM radio add-on is already available.